One of my strongest memories from my time in Botswana was the scent of wild sage filling the air. Even when I’m cooking with sage, I am immediately transported back to Botswana, and Vumbura Plains in particular. Vumbura Plains is a Wilderness Safari premier camp located in the northern extreme of the Okavango Delta. Its location between the wetland and the dry mainland makes it an excellent wet/dry combo safari option; it gets the best of game movements at all times of the year. Land and water-based activities include drives, walks, power boats, and mekoros. The camp itself makes quite the first impression. Both public spaces and the private rooms face the vast delta flood plane and provide some beautiful views. My favorite spot in the camp was the fire deck hanging out over the delta marsh with wide open skies above for great stargazing. Of course, I was enjoying that spot so much that I never took a picture of it! The rooms are large with an open plan and stylish, yet understated decor. All rooms have outdoor showers, comfortable salas & plunge pools out on the deck. At night, you can hear hippos and elephants wandering around right below your window! Inside, the rooms feature a sunken living room, dressing area and open-plan bathroom with the largest shower I’ve ever seen! This would be a perfect hide-away for honeymooners. Every morning your game drive begins by bumping over a low-lying boardwalk-like bridge that allows for access to the camp when the floods are in. If the ground is dry enough, you’ll be completely surrounded by fragrant wild sage. Travel through this field enough times, and you become Pavlov’s dog. Every time you smell sage, your adrenaline will begin to rise and you immediately feel a rush of excitement and anticipation for another amazing adventure! 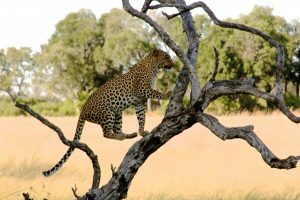 Sightings for the day might include swimming elephants, grazing zebra and giraffe, an energetic leopard, or mischievous hyena. But, don’t forget to look up because Vumbura Plains is full of a dizzying variety of birds! My favorite sighting was the green pigeon. We got so lucky with this great leopard sighting! After your game drive, you might be treated to an incredible bush dinner with lanterns hanging in the trees and seats around a fire that create an adventurous atmosphere. The bush location won’t detract from the quality of service in the slightest; you’ll enjoy a full bar and enormous brai-style buffet. Or, take your sundowner on the deck next to a cozy fire and settle in for one of the most spectacular night skies and star-gazing opportunities. If you’re feeling adventurous, be sure to take advantage of the unique safari activities offered by the camp. The most popular are fishing excursions, sunset cruises, and mekoro safaris. The Mekoro (a dugout canoe) was a highlight for me. 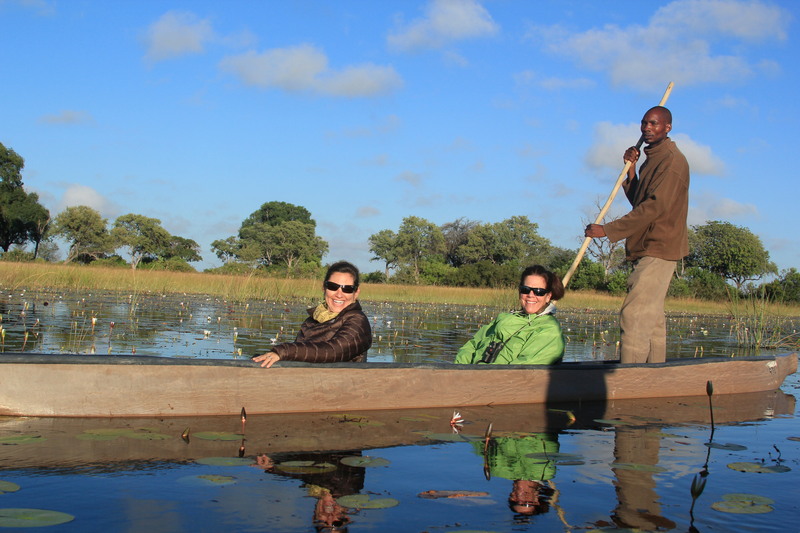 A safari at water level is a completely different experience than one at Land Rover level! My Brownell colleagues, Sam McClure and Martha Gaughen, enjoying their mokoro ride on a crisp fall morning. If Vumbura plains is too much for your budget, one of the best hidden gems in The Wilderness Safari Botswana line-up of camps is Little Vumbura. This classic camp is on a small island in the Delta and requires a boat ride to get there. I’m in love with the romance of arriving to your safari destination by boat, watching this little island emerge from the Papyrus and reeds before you! Little Vumbura is a bit more rustic compared to its sister-camp, but these semi-permanent tents are quite homey and a perfect fit for families or adventurous couples! 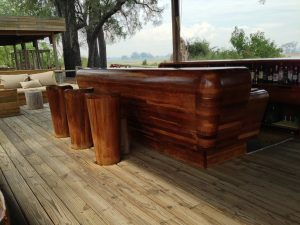 This entry was posted in Africa/Safari, Hotel Reviews and tagged Adventure Travel, Africa/Safari, Botswana, Okavango Delta, pictures, Wilderness Safaris. Bookmark the permalink.